Baldwin in 2016 on set in Washington D.C.
Brooke Baldwin was born in Atlanta, Georgia, where she attended The Westminster Schools, a private college preparatory school. She graduated with degrees in journalism and Spanish from the University of North Carolina at Chapel Hill in 2001. She also studied abroad at Universidad Iberoamericana in Mexico City as an undergraduate. Baldwin began her career in 2001 at WVIR-TV in Charlottesville, Virginia, and later became the morning anchor at WOWK-TV in the Huntington and Charleston, West Virginia area. She later joined WTTG in Washington, D.C. as lead reporter for the 10 p.m. newscast. Baldwin joined CNN in 2008. She anchors CNN Newsroom with Brooke Baldwin on weekdays and is based in New York City. On July 8, 2011, Baldwin co-anchored CNN's special coverage of the final launch of Space Shuttle Atlantis (STS-135) from Kennedy Space Center. Baldwin's documentary To Catch a Serial Killer won a Silver World Medal for Best Investigative Report at the New York Festivals International Television & Film Awards in 2012. She was nominated for an Emmy for her coverage of the New York City chokehold death protests in wake of Eric Garner's death 2014. She covered President Obama's second inauguration in January 2013 from Washington, D.C. In 2015 Baldwin hosted a town hall in Washington, D.C.. on gun violence, for which she was a Peabody Award finalist. Baldwin was criticized during the 2015 Baltimore protests when she incorrectly attributed comments she heard that veterans were responsible for the unrest – saying soldiers who become police officers "are coming back from war, they don't know the communities, and they're ready to do battle." She later apologized via Twitter and on-air the next day. In The Washington Post, Erik Wemple wrote, "CNN's Brooke Baldwin shows rest of media how to apologize". In June 2016, Baldwin reported live from Orlando, Florida covering the victims and survivors of the Orlando nightclub shooting. On January 20, 2017, she covered President Trump's inauguration. Baldwin hosts CNN's New Year's Eve Live with Anderson Cooper, and previously alongside Kathy Griffin, broadcasting live from New Orleans with Don Lemon. Previously, Baldwin hosted from Nashville, Tennessee in 2010 and 2011. In 2017, CNN commissioned Baldwin's series American Woman featuring Sheryl Crow, Betty White, Ava DuVernay, Diane von Fürstenberg, Issa Rae, Ashley Graham, Tracy Reese, and Pat Benatar. In April 2015, Variety featured her in "Brooke Baldwin Gives Surprising Boost to CNN". In December 2015, The New York Times interviewed Baldwin after writing an op-ed on CNN.com about covering mass shootings in America. Marie Claire magazine interviewed her on the subject of covering mass shootings. In 2016, Elle magazine featured Baldwin as one of five female correspondents during the election year of 2016. New York's Downtown magazine featured Baldwin in October 2016. On Saturday Night Live, Baldwin was parodied in a sketch featuring Cecily Strong and Alec Baldwin in October 2016, the week after the release of the Donald Trump Access Hollywood tape. In 2017, Baldwin was featured in a Variety magazine article "Women Surge to Top of TV News in Face of Sexism". Baldwin hosted the AK100 Club event for the travel agency Abercrombie and Kent, and gave a speech, based upon her March 2015 climb up Mount Kilimanjaro. Also in 2016, Baldwin presented an award at L'Oréal Paris 11th Annual Women of Worth Celebration. Other presenters included Blake Lively, Andie MacDowell, Diane Keaton, Aimee Mullins, L'Oréal USA president Karen Fondu, Tamron Hall, Arianna Huffington, Liya Kebede, Karlie Kloss and Eva Longoria at The Pierre on November 16 in New York City. In 2017, Baldwin spoke at the 7th annual Neighbor Celebration in Washington DC for Blue Star Families where former First Lady Rosalynn Carter was honored on March 30, 2017. Baldwin hosted Mother Nature Network's White House Correspondents' Jam at Hamilton Live, Washington DC in April 2017 – featuring headlining band, The Boxmasters, with actor Billy Bob Thornton and Rolling Stones' keyboardist Chuck Leavell. Baldwin gave the commencement address at The University of North Carolina at Chapel Hill on May 14, 2017. In July 2017, Baldwin revealed that she was engaged to English producer James Fletcher. Fletcher and Baldwin were married in May 2018. ^ a b c "Brooke Baldwin". CNN. Retrieved May 17, 2011. ^ Kelsey Weekman (18 September 2014). "Chapel Hill, North Carolina". Atlanta Magazine. Retrieved 28 August 2015. ^ Staff, By the CNN Wire. "Space shuttle Atlantis lifts off on 'sentimental journey'". Retrieved 2017-05-07. ^ "CNN Awards – CNN Press Room – CNN.com Blogs". cnnpressroom.blogs.cnn.com. Retrieved 2017-05-07. ^ "CNN's Brooke Baldwin apologizes for suggesting veterans 'ready to do battle' in Baltimore". Yahoo! News. 29 April 2015. Retrieved 28 August 2015. ^ Wemple, Erik; Wemple, Erik (2015-04-29). "CNN's Brooke Baldwin shows rest of media how to apologize". The Washington Post. ISSN 0190-8286. Retrieved 2017-05-07. ^ CNN, Brooke Baldwin. "Climbing Mount Kilimanjaro: 10 essential lessons". CNN. Retrieved 2017-05-07. ^ CNN, Brooke Baldwin. "Finding the meaning of home in Africa". CNN. Retrieved 2017-05-07. ^ Anchor, Brooke Baldwin, CNN. "Brooke Baldwin: There's been a shooting ... again". CNN. Retrieved 2017-05-07. ^ CNN, Brooke Baldwin. "Brooke Baldwin: I'm reporting on a world at war. He's fighting in one". CNN. Retrieved 2017-05-07. ^ Anchor, Brooke Baldwin. "CNN's Brooke Baldwin on front lines of war on terror". CNN. Retrieved 2017-05-07. ^ Anchor, Brooke Baldwin, CNN. "Brooke Baldwin: Speaking like this to women in 2017? No way". CNN. Retrieved 2018-03-19. ^ "American Woman with Brooke Baldwin". Retrieved 2018-03-19. ^ "CNN Digital Presents "American Woman with Brooke Baldwin"". cnnpressroom.blogs.cnn.com. Retrieved 2018-05-29. ^ "From Diane von Furstenberg to Issa Rae, Brooke Baldwin Interviews Industry Trailblazers in New Digital Series". PEOPLE.com. Retrieved 2018-05-29. ^ Steinberg, Brian (2015-04-09). "Brooke Baldwin Gives Surprising Boost to CNN". Variety. Retrieved 2017-05-07. ^ Anchor, Brooke Baldwin, CNN. "Brooke Baldwin: There's been a shooting ... again - CNN". CNN. Retrieved 2018-06-02. ^ Koblin, John; Somaiya, Ravi (2015-12-04). "A Grim News Playbook in Repeated Mass Killings". The New York Times. ISSN 0362-4331. Retrieved 2017-05-07. ^ "What It's Like to Report Live on Mass Shootings". Marie Claire. 2015-12-07. Retrieved 2017-05-07. ^ "Elle Features Next Generation of Female Newsers". www.adweek.com. Retrieved 2017-05-07. ^ "020 Downtown Magazine NYC Fall 2016". issuu. Retrieved 2017-05-07. ^ "SNL Versions of Elaine Quijano, Brooke Baldwin Highlight Saturday Night Live Cold Open". www.adweek.com. Retrieved 2017-05-07. ^ Littleton, Cynthia (2017-04-18). "Women Surge to Top of TV News in Face of Sexism". Variety. Retrieved 2017-05-07. ^ Hart, Karen (2017-03-30). "Blue Star Families Celebrates Civilian Neighbors, Honors Former First Lady Rosalynn Carter". Huffington Post. Retrieved 2017-05-07. ^ Smilowitz, Elliot (2017-04-29). "CNN's Brooke Baldwin takes center stage at musical correspondents' dinner party". TheHill. Retrieved 2017-05-07. ^ VanGraafeil, Mc (2017-01-11). 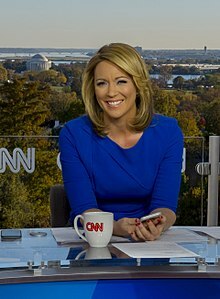 "Brooke Baldwin, CNN anchor, to speak at UNC-Chapel Hill Commencement". UNC News. Retrieved 2017-05-07. ^ CNN, Brooke Baldwin. "Alec Baldwin, Sheryl Crow, other celebs offer advice to Class of 2017". CNN. Retrieved 2017-05-31. ^ "CNN anchor Brooke Baldwin engaged to British producer - Radio and TV Talk". ^ Coleen, Kratofil (May 9, 2018). "All the Details on CNN Journalist Brooke Baldwin's Gorgeous Naeem Khan Wedding Dress". People. ^ "CNN's Brooke Baldwin and James Fletcher Are Married". www.adweek.com. This page was last edited on 18 April 2019, at 06:43 (UTC).